The original pieces always have a unique look that i can't explain, so i would like to show you some pictures from the original "Smile!" individual pieces. Some parts were broken ors scratched due the demold process and some little accident. This is the big one, the first one i made from the 3, this was the main idea i was working, a big and togh birthday gob with a inusual and innocent looking. I wanted to capture this goblins like they were waiting for someone to take a picture, that's one of the reasons i choosed the "Smile!" name for the bust composition. 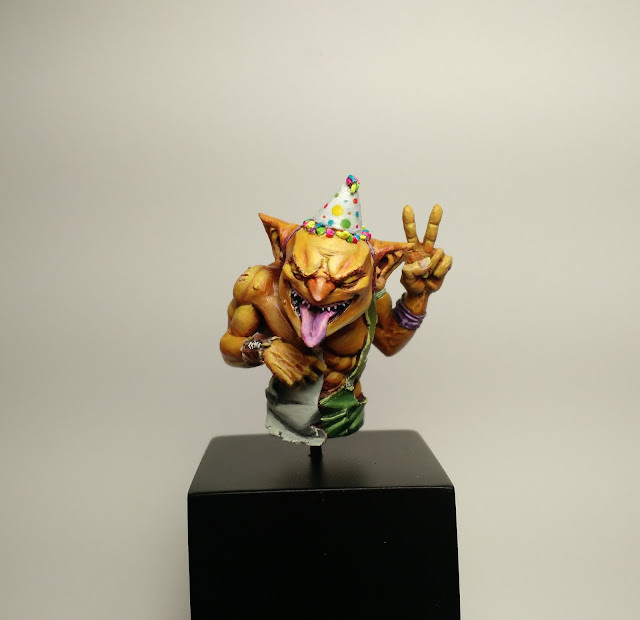 I would like to present my first painted bust, this goblin is a part from a bust composition called "Smile!" 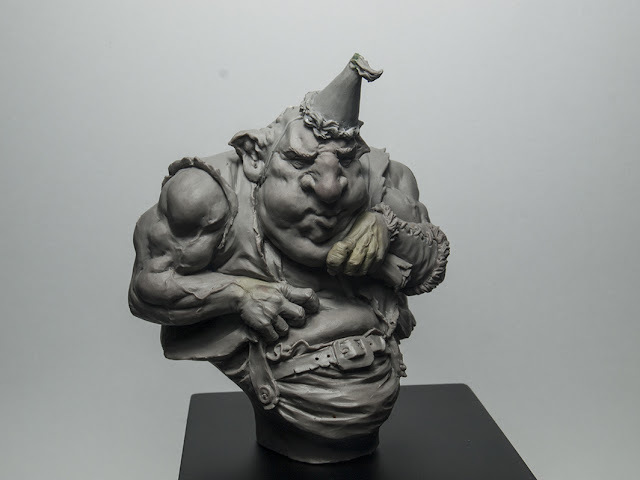 I made the original sculpt, casting and actually i'm painting it. This is the first mini i paint after a Banshee's master class i did some months ago, so i'm very grateful for the lessons. I've learned a lot in this project working with primary colours and no glazing technique, only using some fluor colours to highlight some parts, about 20 Hours . This is very special to me because i always have been afraid of painting, but since i met Roman Lappat and Alfonso painting methods i've completely changed the mentality about painting. So much fun now! If you are interested in the kit, you can purchase in the web store. I know that watching the proccess can be really helpfull and didactic so i'm uploading a few "Smile! 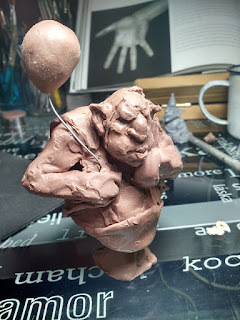 goblin party" pictures that may help you to understand the creative steps i followed with this pieces. And as i promised finally release the Smile! 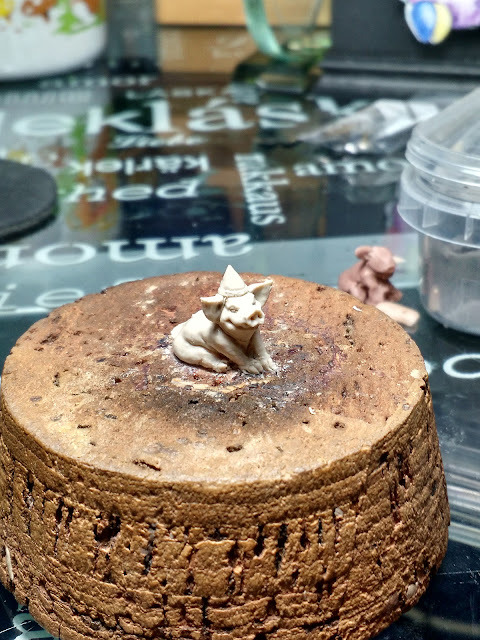 Goblin party kit, additionally you can purchase this tiny 1/12 piglet to your collection only for 1,60€ in the store, free with the birthday edition pack for a limited time! 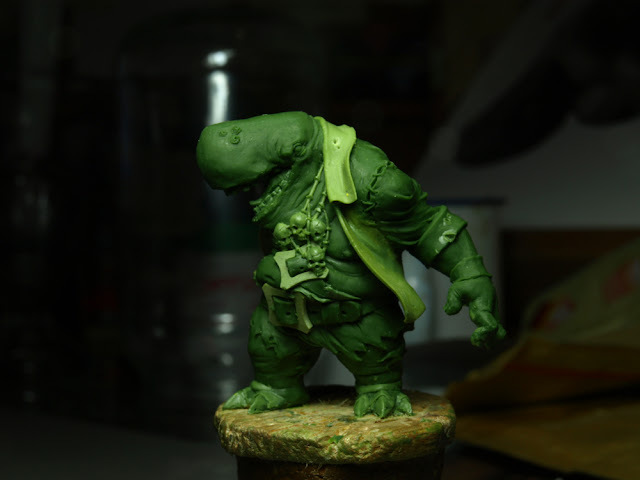 Rum and bones kickstarter miniatures on the gallery! 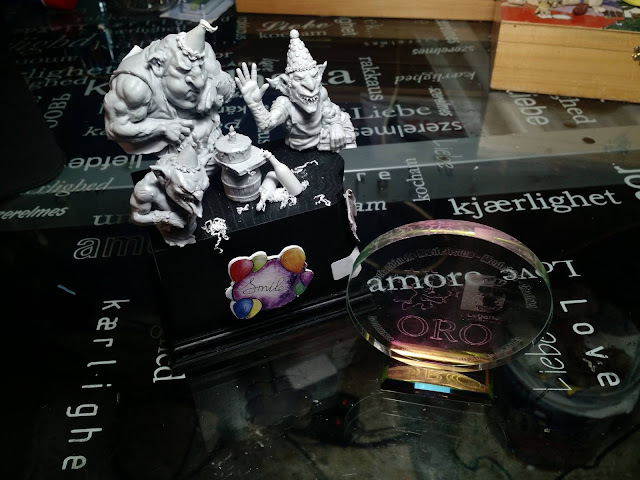 Finally the second Rum and bones kickstarter by Coolminiornot has ended succesfully after a long time, years had past and i'm glad to show you some of my miniatures that i still preserve original pictures, hopefully i'd get the others someday to share with you the rest of the greens i did. Great project made under the direction of Big child creatives, i had a big time working in this project for long time, sharing and learning a lot from plenty of profesional from the hobby. Definitively i made lot of progress in that moment, learning new proccess and some perspective, after some trouble at the first miniatures i began to adapt my sculpts to the original comic style and concept art but the final results were very pleasant at the end. Hey friends! I'm glad to upload the (Smile!) 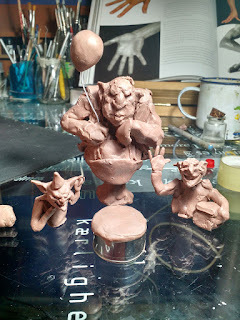 goblin party to my blog galery, you can find plenty of pictures from the piece, won gold in sculpture discipline in Leganés miniature contest. Very soon available on the store! 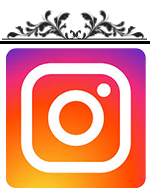 Keep checking for last updates.